On Friday, September 14, 2018, Sandi and Mark Diehl purchased our cottage and house along with 20 acres and 80% of the business (Stonewall Creek Vineyards). We’ll still be around from time to time, but Mark and Sandi will be running the show. They grew up in Michigan and we grew up in Iowa, so the owners are still from the Midwest and have spent the majority of their adult lives in Georgia! Sandi and Mark Diehl are both Michigan natives who have made Georgia their home for close to 40 years. They met at Western Michigan University and each went on to medical school and medical practices; Sandi in psychiatry and Mark in orthopedics. Orthopedics and wine are the connection between our two families. Carl and Mark first crossed paths in the early 1980s at Scottish Rite Hospital (Children’s Healthcare) in Atlanta. Mark was an orthopaedic surgery resident and Carl was the attending orthopaedic surgeon. Carl and Mark would see each other at Georgia Orthopedic Society meetings from time to time and both served as volunteer Co-Directors of Athletes Care at the World Congress Center during the 1996 Olympics. In 2010, Sandi was reading the GEORGIA MAGAZINE, published by Georgia EMC, and saw an article that mentioned Stonewall Creek Vineyards and Carl Fackler. A vineyard? Carl? From that moment on, Sandi and Mark have helped us in the vineyards, the winery and the tasting room. Three years earlier, Sandi and Mark both started making wines at home, a family tradition in Sandi’s Italian family. (As time goes on, you’ll learn more about Sandi’s grandfather, Erasmo Palumbo, who immigrated to the U.S. in 1922, earning enough money to finally bring his family over around 1936.) They purchased grapes from California and made wine in their basement under the label, Due West Cellars. 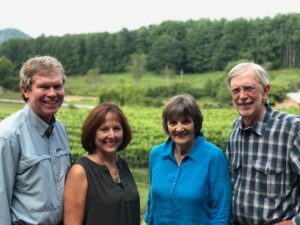 Sandi and Mark met more home winemakers and began teaching winemaking in their Cobb County home. They entered competitions and the first to take an award (gold medal) was a Cabernet Sauvignon (grapes from California). Both wanted to learn more about wine and applied for the Wine Judge Certification Program, a three-year course of study sponsored by the American Wine Society. Both are now Certified Wine Judges (AWS) and have traveled to wine competitions throughout the U.S. In October 2015, Mark retired from surgery and until recently, maintained an office and administrative practice. They are the parents of three daughters and a son–Donna, John (wife Rachel and their daughter Annina), Melissa (husband Martin) and Sara. The entire family visited Italy several times over the years, touching base with Sandi’s family, many of whom still follow the family tradition of making wine for their own consumption. The little fella running around after Mark’s golf cart is their rescue dog, Mo (short for Mozart). The majority of grapes planted at Stonewall Creek Vineyards are French Vinifera. Will there be Italian vines in the future?Mark notes that the science part of winemaking is “easy for a doctor.” It’s the farming side he’s working on. Our original property purchase of 16 acres in 2004 plus subsequent land purchases of another 14 acres, were once part of the 110-acre Stonewall Creek Farm. For nearly a hundred years, the owners managed the farm and lived in the old farm house on the hill across from the vineyards. Tasters who stopped by last year or early this year saw a “for sale” sign. We bought the old farmhouse, barn and shed on 3 1/4 acres in May. The barn was on its last legs and was the first to go. Our contractor friend John Schomburg created living space for us in the old apple shed. (We call it the “luxury apartment”—one room with bath and no kitchen.) Meanwhile, we started work on the old farmhouse and soon discovered it had issues of every description, including rotten wood from top to bottom. So, we were looking at tearing it down and building a new house. Friends and friends of friends salvaged cabinets, bathroom fixtures, windows, doors, light fixtures, furnace, hot water heater, wall and ceiling bead board, wood stove and more. There are now pieces of that old house being repurposed throughout Rabun County! We consider ourselves extremely fortunate to have lived our dream! Along the way, we’ve met so many wonderful taster friends! During our 14 years in the business, North Georgia Wines have grown in stature and are now recognized throughout the United States! We’ll be around and hope to see you from time to time. In the meantime, we know our “baby” is in good hands! Our hearts will always be in Rabun County.